Mountain biking is another activity which you can enjoy at your own speed. At Adventure 21 we hire in only the best mountain bikes for our sessions. All equipment is checked before the session for safety. 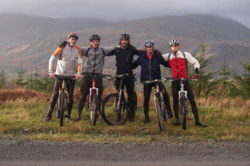 Mountain biking is a great way to enjoy the outdoors either as a couple or as a group on a stag or hen party or on a school trip. Whether its easy flat tracks at a leisurely pace or fast technical downhill routes.. we've got it all! have the instructors to guide you around. use many off road cycling and mountain biking venues in and around Wales, Lancashire and Cumbria in particularly around the North Lake District, South Lake District, East Lake District and the West Lake District areas, for example Coniston, Ambleside, Windermere, Keswick, Hawkshead, Kendal, Bowness, Ullswater to name just a few. are more than happy to send you in the right direction to find suppliers of bike equipment or the best routes to ride. Just give us a call. Please note that as with sailing there is an extra hire charge for bikes. Charges will depend on the type of mountain bike hired. Please call or e-mail us for further details.